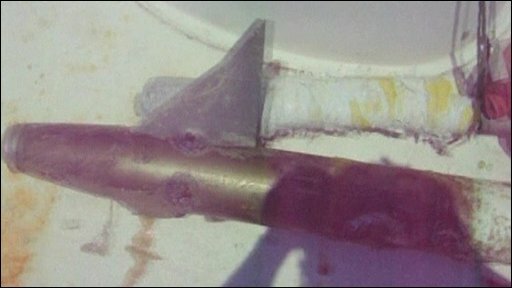 A commercial fisherman in Florida had a lucky escape after netting an unusual catch - a live air-to-air missile. 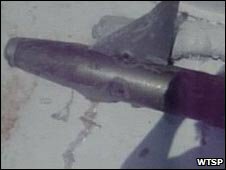 Long-line fishing boat captain Rodney Solomon reeled in the missile in the Gulf of Mexico, about 50 miles (80km) off Panama City in Florida. Finding a hole in the missile, Mr Solomon assumed it had gone off. He kept it as a souvenir and went on fishing for more than a week. He said it was "a fright" to discover that "any time it could have exploded". The local fire chief, Derryl O'Neal, told the BBC that Mr Solomon had reported the find on his return from his trip. Mr Solomon admitted the experience "was kind of a fright"
"He actually came to the fire station and told us he had caught a Tomahawk missile, but it turned out not to be - it was an air-to-air guided missile" known as a Sidewinder, Mr O'Neal said. Mr O'Neal's staff quickly secured the area around the missile and told people to leave. "We were very worried - and even more when the air force confirmed to us that it was live," he said. But the missile was safely dismantled. The area in which the missile was discovered is in or near a zone used by defence forces for testing. "Occasionally this does happen - I remember a missile was discovered some 15 or 16 years ago," Mr O'Neal said. "But really it's a rare event and we're not concerned that it will happen again any time soon." 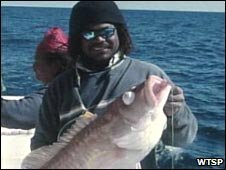 Local fishermen are being advised not to bring in any similar discovery, but to alert authorities to its exact location. Mr Solomon says fishermen are used to being in danger and are usually unflappable. "We're fishermen, nothing scares us! ", he told local news organisation WTSP. But this experience "was kind of a fright". He said: "It was like, 'wow man, you all took a big chance bringing in this missile. You had it on your boat for 10 days and any time it could have exploded on you'."